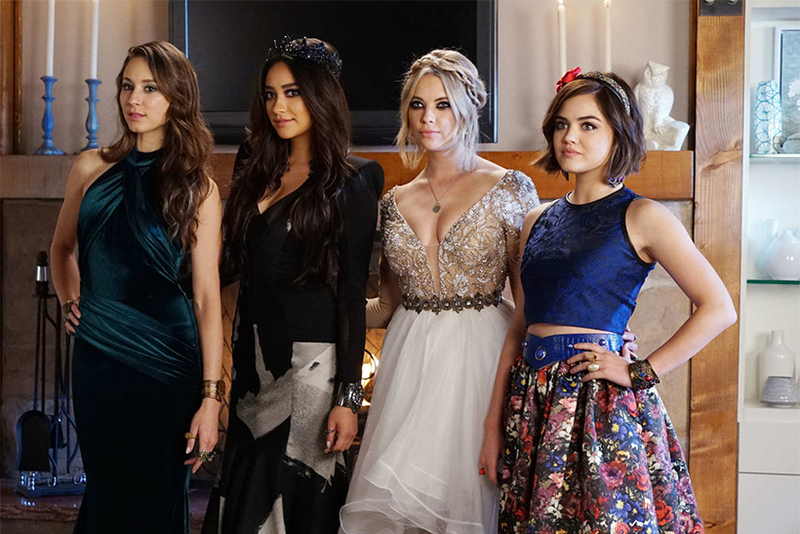 If you tuned in to last week’s “Pretty Little Liars” prom episode on ABC Family and fawned over the flowing tresses, stunning braids, or immediately began envisioning yourself with Aria’s short and sassy ‘do, we have some great tips and tricks on achieving the looks from the big night straight from the source. The show’s hair department head hairstylist Kim M. Ferry has shared her styling tips for the big dance, along with hair tips from season 6. At this point in our season, my hair department’s “Top Hair Moment” is definitely the prom episode, “Last Dance.” We designed some great hairstyles; built, cut, and added human hair extensions and intricate braids. I hired a jewelry designer, Mary Anne Brown (@energeticjewlry) and she made some beautiful custom hair accessories, all handmade for one special PLL. Interesting fact: Mary Anne picks stones that all have “energetic properties” with the intention of bringing joy to the wearer. I thought that was pretty cool to use on-camera. I also custom made some flower hairpins and a lovely hair braid I clipped into an updo for another PLL. We even established some fun hairstyles on our Rosewood High School background prom guests as well. It was a big episode with loads of hair fun! The technique is really very close to that for the shorter hair I described above. To create larger waves, simply switch to a larger iron, but I think a 1-inch hot iron works great with longer beach waves as well. Still use a good setting spray and curl vertically instead of horizontally and be sure to pull the wave out as it cools. Our PLL characters’ personalities and their “hair personalities” can change episode-to-episode. One day the girls could be at school, with long flowing hair in wonderful, shiny beach waves and then they can hop in a car and be in “Sleuth Mode” with ponytails or have messy buns because they are hunting down answers on a dark night; or maybe they all have disheveled, dirty hair because “A” has locked them all in a terrible place! The scenes unfold in our scripts and the writer’s descriptions often mold the look for every character on “Pretty Little Liars.” I take my direction and consult the products and then the actors and create the best look for each moment we have on-screen. I want everyone to be happy — producers, writers, actors, and of course our amazing loyal fans! The PLL’s hair has evolved a lot in seasons 4, 5, and now 6. We are heading into new directions soon and have even more hair surprises coming in the second half of the season, so be sure to tune in! Love the short ‘do. I wonder if I can pull off a head band with a headful of gray, hahaha. It would have to be the right headband, I guess. I love the beach waves look! Its so classy in my opinion. I wish my hair would work better though with a curling wand, no matter what I do I can never get it right and it winds up a frizzy mess. Thank you so much – I needed these tips! Whenever I try to do beach waves it ends up just looking messy. I will try these tips! I love the look of long , beachy waves! Thanks for the great tips! I have always loved the fashion and hair styles from PLL. I have to start watching the series again. I am always trying to find a fun way to style my long hair. Thanks for the tips!